By Cathy Combs, Eastman Chemical Co.
Sustainability has proven not only to be the “right thing to do,” but also a significant growth driver at Eastman. We have invested substantial resources in sustainable technology, products and processes. Several comprehensive waste-reduction and management programs across the company’s global footprint underpin our sustainability strategy. Our waste-reduction strategies range from large-scale, company-wide initiatives to smaller, more-localized efforts that are yielding meaningful results. One of the most important factors contributing to sustainable manufacturing — especially within the chemical industry — is supply chain efficiency. It’s estimated that more than $2 trillion worth of chemical materials are shipped each year; these shipments require a vast international transportation network of ships, trains, trucks and planes. To reduce waste and minimize the environmental impact of this network, it’s critical that chemical companies and suppliers work together to create a globally integrated supply chain. One strategy employed by Eastman involves alternative supply arrangements or “bilateral agreements” in which manufacturers transfer ownership of chemical materials across international borders. Such arrangements are feasible because different chemical makers in various locations around the world produce many of the same materials. So, rather than two companies simultaneously shipping the same chemicals to customers in each other’s geographic region, they can simply exchange orders and ship to the nearer customer, effectively cutting out substantial transportation-related waste (Figure 1). Figure 1. Under bilateral agreement, company doesn’t ship product long distances to supply customers far from its plants (top) but relies on manufacturers closer to customers to fulfill orders (bottom). Eastman’s bilateral agreements account for more than 20,000 metric tons of product every year. In addition to the obvious cost savings involved, the agreements can play a significant role in reducing carbon emissions. Eastman saves about 3,000 t/y of CO2 emissions compared to conventional shipping, which equates to about 4% of the total environmental impact of the products shipped from “cradle-to-gate,” i.e., from raw materials extraction through the point of sale. Like all chemical manufacturers, Eastman requires a substantial amount of energy to power its advanced facilities and manufacturing plants. The company uses several strategies and processes to ensure operations are as efficient as possible. One key element is cogeneration — also known as combined heat and power (CHP) — which involves recovering heat that otherwise would be wasted during electricity generation. Our manufacturing site in Kingsport, Tenn., has used cogeneration successfully for more than 80 years. The facility’s cogeneration systems produce enough energy to support onsite manufacturing processes, help regulate heating and cooling for more than 600 buildings, and run 19 steam turbine generators with a combined capacity of 200 MW (enough to power a city of nearly 170,000 homes). In fact, cogeneration has helped Eastman convert more than 70% of the energy obtained from fossil fuel into power and steam for manufacturing. This, in turn, decreases the company’s greenhouse gas emissions. Using cogeneration at the Kingsport site alone reduces emissions equivalent to taking 131,000 cars off the road each year. Our success has received important recognition. In 2014, the U.S. Environmental Protection Agency (EPA) honored Eastman with an Energy Star CHP Award for excellence in combined heat and power operations. Eastman’s worldwide energy management program, led by a full-time certified energy manager, drives energy projects and improvements across the organization. Since 2008, we’ve seen an 8% reduction in energy intensity. As a result of our energy management efforts, the EPA has recognized Eastman with five consecutive Energy Star Partner of the Year awards. We’ve received the Sustained Excellence award, EPA’s highest Energy Star honor, for the past three years. We are the only chemical company to be recognized more than once and the only one to achieve Sustained Excellence status. We continue to build on the progress we’ve made as we work to meet our 2020 goal to reduce energy intensity by 20% compared to the 2008 baseline. In addition to company-wide waste reduction initiatives, Eastman has also piloted with great success several waste-management programs at specific corporate and manufacturing sites. For example, employees at Eastman’s corporate headquarters in Kingsport recently spearheaded a trash audit, sifting through more than 1,000 lb of waste to determine which materials currently being discarded could have been recycled. They found significant opportunity to improve recycling site-wide. Of the 1,000 lb of waste, about 25% could have been recycled through existing recycling channels while 54% had the potential to be recycled if new, more-innovative recycling channels were developed. As a result of the audit, Eastman’s corporate sustainability team converted the company’s existing recycling bins for glass bottles and paper into “single stream” recycling containers, which are designed to accept nearly all recyclable materials. During the four months leading up to the launch of single stream, the site averaged 8.5 tons of office recyclables per month. Since implementation in May 2015, the Kingsport site is averaging 12.9 t/mo of office recyclables, an increase of approximately 66% by weight. • ensuring all remaining waste streams were fully recyclable, resulting in the creation of new revenue. By 2011, after only two years of implementation, the Belgian site achieved zero waste to landfill. Additionally, the initiative resulted in a one-third cut to overall facility costs. The program was such a success that the Ghent Chamber of Commerce considers Eastman a model for other organizations and regularly invites our Ghent employees to provide training and insights to local manufacturing facilities. As a part of its ongoing commitment to sustainable innovation, Eastman is working to implement whenever possible waste-reduction programs at other sites across the company’s global footprint. Lifecycle assessments (LCAs) are critical to analyzing the overall sustainability of Eastman’s products and, ultimately, identifying waste reduction opportunities across the supply chain. LCA work at Eastman is focused on estimating the potential environmental impact of products throughout their full lifecycle, from raw material extraction to point of sale (cradle-to-gate) and, when possible, consumer use and disposal (cradle-to-grave). To date, Eastman has completed cradle-to-gate LCAs on more than two-thirds of its products. Valuable outcomes of LCA research include insights into how Eastman can improve manufacturing processes, packaging design and distribution protocols as well as sustainable product innovations and enabling sustainability advantages for our customers. For example, an LCA performed on Eastman GEM technology identified a process improvement that would save both carbon emissions and waste. The existing equipment used a steam jet to draw a vacuum to dry the product. The LCA showed that a vacuum pump could accomplish the same goal more effectively, reducing the energy required for the vacuum system by more than 80%. Additionally, the change in process decreased the amount of excess raw materials required as well as the load going to wastewater treatment facilities. Thanks to waste management strategies, Eastman can tackle waste reduction on the individual product level. Acetate yarn, which is used to create a variety of fabrics and other materials, is one product for which Eastman has improved sustainability, specifically with regard to packaging. The company’s Recy-Pack acetate-yarn packing system replaced cardboard trays with sturdier reusable ones, eliminating 27-lb-per-case of packaging material from being discarded as waste. The trays have a virtually unlimited lifecycle, which allows them to be cleaned, reassembled and returned to Eastman for reuse. 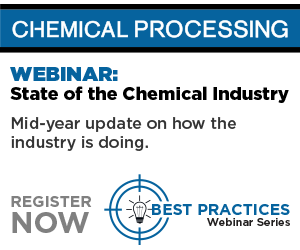 The chemical industry is evolving rapidly. Each year, chemical manufacturers must consider new environmental and regulatory challenges as part of their overarching sustainability strategies. One thing is certain: waste management will continue to play an important role in minimizing the environmental impact of chemical manufacturing. At Eastman, we’re committed to exploring innovative ways to meet our waste reduction goals. Working with corporate peers and industry organizations is an imperative for identifying solutions to the most-pressing issues facing chemical manufacturing today. In 2011, Eastman joined a technical coalition called the Healthcare Plastics Recycling Council (HPRC). This group, comprised of representatives throughout the value chain for products used in healthcare, is focused on understanding the issues and creating solutions to recycle plastics used in hospitals and other clinical settings. HPRC strives to overcome the challenges in collecting and processing these plastic materials. Over the past few years, this group has created a body of knowledge about the materials used in healthcare, including waste flows through hospitals, and technical expertise on co-mingling some materials when reprocessing. Now, HPRC has pooled this collective knowledge and teamed with the Society of the Plastics Industry to launch a recycling project with multiple hospitals and recyclers in the Chicago area to demonstrate the technical and economic feasibility of recycling these smaller-volume non-traditional materials. Eastman strongly believes that collaboration is the key to understanding and solving these complex sustainability challenges. As a resin supplier to this industry, it is our responsibility to help be part of the solution, and we are excited about the progress this group has made since its formation in 2010. CATHY COMBS is director of sustainability for Eastman Chemical Co., Kingsport, Tenn. E-mail her at ckcombs@eastman.com. Take some low-cost steps to enhance plant efficiency. Index provides insights about product portfolio and new developments.